I have just changed my personal blog WordPress theme to a Christmas WordPress theme. I used the same Christmas theme last year. I wish those creative WordPress theme designers will come out with more themes that are in tune with the latest WordPress version. Unfortunately, I cannot find any fresh designs. Since none of the themes out there impress me much, I won’t be sharing the links as you can easily Google Christmas WordPress themes and pick one yourself. They are all almost identical as I believe there are less than 20 choices. So, if you are a WordPress theme designer…DUDE, MAKE SOME NEW ONES, PLEASE! You will get lots of link backs, you know? However, there is one Christmas snowfall plugin that I adore. Previous years, I used AndyBeard Snowfall plugin which comes with large snowflakes design. However the plugin doesn’t seem to work or available for download from Andy’s site. So, I stumbled on another Christmas snowfall plugin. I love how the snow falls on my blog. I get a sense of peace though I have never see real snow falling. It is just lovely. See the snowfall on WordPress on my personal blog. Of course, make money bloggers may not be keen to go Christmassy mood. But if your blog is targetting women, food lovers, parents and shopping, do change your blog theme to get your visitors into the mood. They may get infected with the festive mood and click on one of your ads or affiliate link to buy something, you know? Hey lilian, this theme looks really nice and reminds me of my first encounter with real falling snow last year in Korea. It’s true I really feel a sense of peace when they fall slowly on my face. Although US and European bloggers may think it is nothing new, we from Malaysia and S’pore have to pay to travel to see snow, so unfair hor. Haha. I like the theme but this year i think i will just modify my blogs current theme to make it look seasonal. I found out that a theme has a lot for my visitors experience, I like the snow falling theme as it will go well with most superstitions bloggers that believe Christmas and snow go hand in hand. P.S. I think MMO blogs are qualifying for this tweak too… let’s give it a try! There are a few quite nice looking themes for WordPress but sadly they won’t fit our blogs’ niche. vkeong – Wow, nice theme you intro. 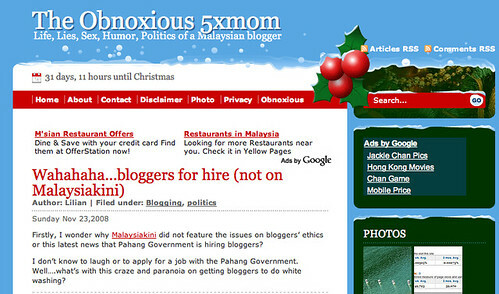 Unfortunately, you know lah…my blogs has to please ‘them’ more as I cannot have a main page like that. Boh pien. Hehehe. Its great to look at different themes for Christmas.Wordpress has so many plugins that you can download for free. This adds more advantage……….